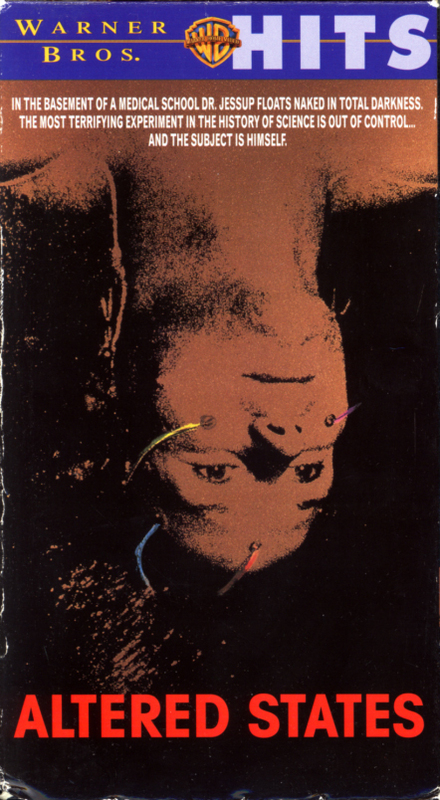 Altered States on VHS. Movie starring William Hurt, Blair Brown, Bob Balaban, Charles Haid. Based on the novel by Paddy Chayefsky. Directed by Ken Russell. 1980. IN THE BASEMENT OF A MEDICAL SCHOOL DR. JESSUP FLOATS NAKED IN TOTAL DARKNESS. THE MOST TERRIFYING EXPERIMENT IN THE HISTORY OF SCIENCE IS OUT OF CONTROL… AND THE SUBJECT IS HIMSELF. Research scientist Eddie Jessup (William Hurt) believes other states of consciousness are as real as everyday reality. Using sensory deprivation, then adding powerful hallucinogenic drugs, he explores these altered states… and endures experiences that make madness seem a blessing. Academy Award winner William Hurt as Jessup (his film debut) heads a solid cast featuring Blair Brown, Bob Balaban and Charles Haid. Working from Paddy Chayefsky’s novel, director Ken Russell guides us with a sorcerer’s skill through Eddie’s magical and horrific journey as Altered States gyrates with dazzling visual bravado and rumbles with John Corigliano’s all-stops-out, Oscar-nominated score. Unlock the doorways of your mind — if you dare.